Working for a photography magazine, we get to test all the latest cameras and kit, and get to go to nice events. However, for the vast majority of the week I sit, hunched, at my desk, typing away, checking emails, making phone calls and checking the proofs of the next issue. When I am out I’ve usually got a camera and a few lenses in tow. Modern life has taken its toll on my back and shoulders, and on a recent weekend away I decided that I was going to travel light. There would be no DSLR coming with me. I wasn’t even going to take a CSC. 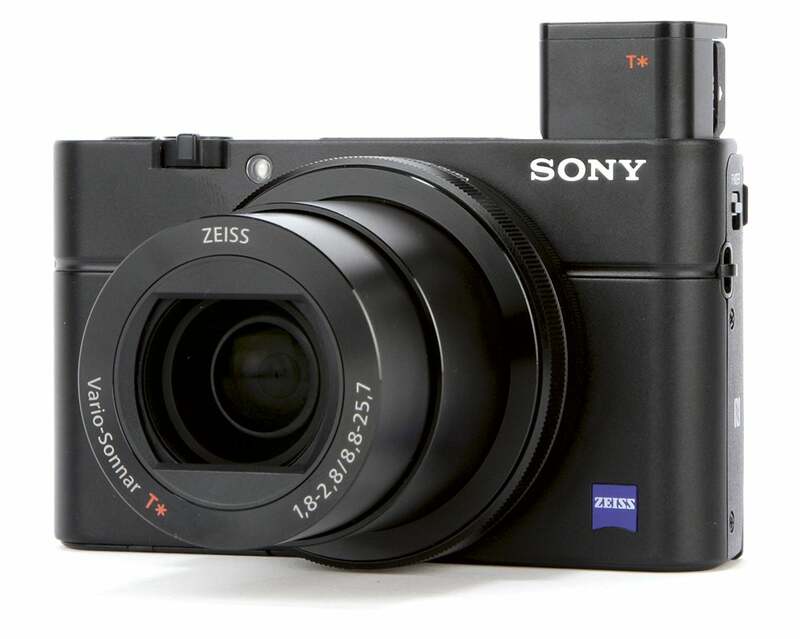 I opted for just a compact camera – the Sony Cyber-shot DSC-RX100 III, to be precise. Instead of having to trawl around with a camera and lenses, and spend my time worrying about shutter speeds, apertures and a whole host of other settings, I would keep things as simple as possible. I wanted to relax and enjoy my holiday. As photographers, I think it is all too easy to get carried away with taking the photo, rather than enjoying what you are seeing. So I was off for a long weekend in Sorrento, Italy, with only the RX100 III in my bag. Actually, I was able to tuck it in a pocket. I’ll admit that I chose the RX100 III for two reasons. First, I’ve been a long-time user of the RX100 and its successor, the Mark II, but I’ve only used the RX100 III when I originally tested the camera (WDC, August 2014). This would be a great opportunity to really see what it would do in a real-world test. Second, I couldn’t give up too much control. ‘What if I see a great shot?’ I thought – I’m sure we all think the same when contemplating what to put in our camera bags. With a 1in, 20MP sensor, Aperture and Shutter Priority, full manual control and Raw shooting, I had all I needed. There are obviously compromises when using a compact camera. The smaller sensor is the main one. They are noisier than the larger Four Thirds and APS-C-sized sensors, and the dynamic range doesn’t tend to be quite as good in shadow areas. However, the RX100 III has a 1in sensor – significantly larger than most compact cameras of its size – and a f/1.8-2.8 maximum aperture lens, which lets in a lot of light. This meant I should be able to get images with plenty of detail. It may not quite be able to match a DSLR sensor in some regards, but heading off to a part of the world where I’d be taking photos largely during the daytime in, hopefully, sunny weather, I wasn’t too concerned. 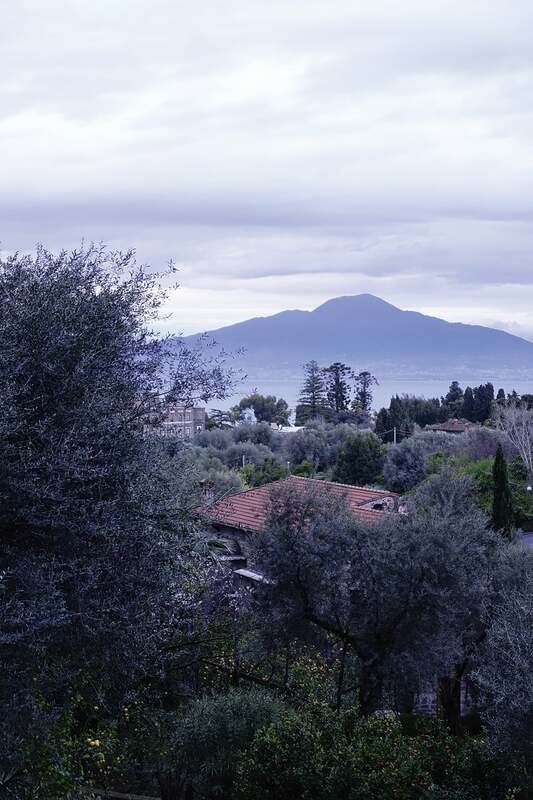 On arrival at the hotel on the side of a hill overlooking Sorrento, the sun was beating down. Usefully, I had forgotten my sunglasses and was squinting as my wife and I sat having lunch. The first shot I wanted to take with the RX100 was the obligatory view from the hotel. While I could just about make out the screen in the strong sunshine, keeping my eyes open wide enough to compose a shot was more of an issue. Thankfully the camera features a 1.44-million-dot EVF. Uniquely, the viewfinder pops up from inside the body of the camera, thus helping to keep its compact size. 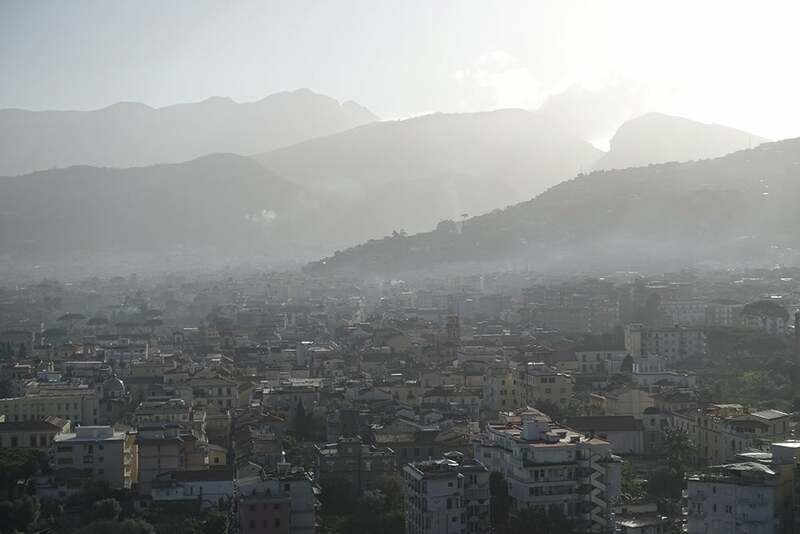 With the viewfinder’s image bright and clear, I was easily able to compose the shot of Sorrento from the hotel, without being temporarily blinded by the sun. I do have a niggle about the EVF, though – when you push it back in after being used, it automatically assumes you have finished taking photos and the camera turns off. In many cases this may be true, but I then quickly pulled the camera up to fire off a snapshot of the hotel pool, only to find I needed to turn the camera back on. Heading out for dinner with just the RX100 III in its case felt remarkably different, even uncomfortable at first. The weight wasn’t the issue, but rather the lack of it. I felt like I was missing something. After dinner, I panicked for a second when my camera bag wasn’t tucked under the table by my feet, then I remembered I didn’t have it. I did still have that feeling that I may miss an opportunity by not having a DSLR with me. The next day would be the real test; we were heading out for a day that included visiting Pompeii and enjoying pizza in Naples, before walking up Mount Vesuvius. Waking up at 6:30am, it was clear it was going to be a good day. The sun was rising over the mountains, leaving a hanging mist halfway up. It was quite a view with which to sit and have an espresso at breakfast. I headed out to the balcony and took a few images with the RX100 III set to its natural image style. This produces soft colours that created an almost monochromatic image that perfectly suited the morning haze. As we headed out for the day I remember feeling lighter on my feet than usual. Again, I’d usually have a bag, or at very least a DSLR, slung over my shoulder. First stop was the Roman city of Pompeii. There were plenty of things to take photos of, mainly snapshots and moments of our holiday. I was happy to put the camera into aperture priority mode, and auto ISO. With the aperture set to f/5.6, the 24-70mm equivalent lens is sharp and has the equivalent depth of field as a full-frame camera with a 28mm lens set to f/16. The depth of field is more than enough to capture all you need, and in bright sunlight the auto ISO sensitivity didn’t creep above ISO 200. After a stop for authentic Neapolitan pizza in Napoli, we took a quick walk along the seafront. Here, a photographic opportunity presented itself: the rocky sea defences with an old fortress in the distance, all set below a bright, but cloudy sky. Realising the potential of the scene, I used the control dial around the lens of the RX100 III to switch the aperture to f/8 to give me a little more depth of field – the fortress was probably about half a mile away, and the rocks a lot closer. I also used the function button to access the quick menu and change the image colours to black & white. As I was capturing both raw and JPEG images, the black & white in-camera JPEG would give me an idea of how to edit the raw file. Again, the camera coped perfectly with the situation and I didn’t miss having a DSLR at all. At this point, I have a confession to make. At the top of Mount Vesuvius, I took a selfie with my wife. The articulating screen of the camera made this easy, and when a face is detected and the shutter is pressed, a 3sec countdown begins so you have time to prepare your big grin. Yes, I know, but it’s not meant to be art, it’s for a picture frame at home. 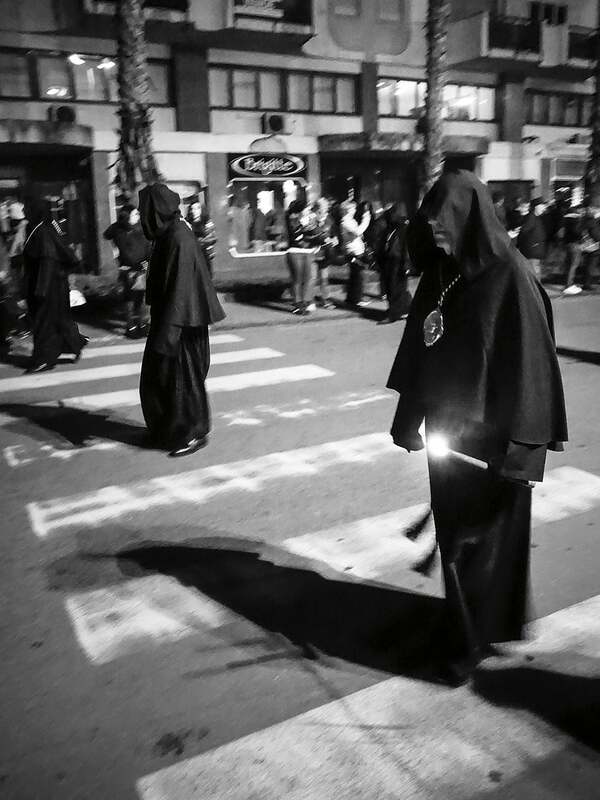 That night was the Good Friday procession through Sorrento. 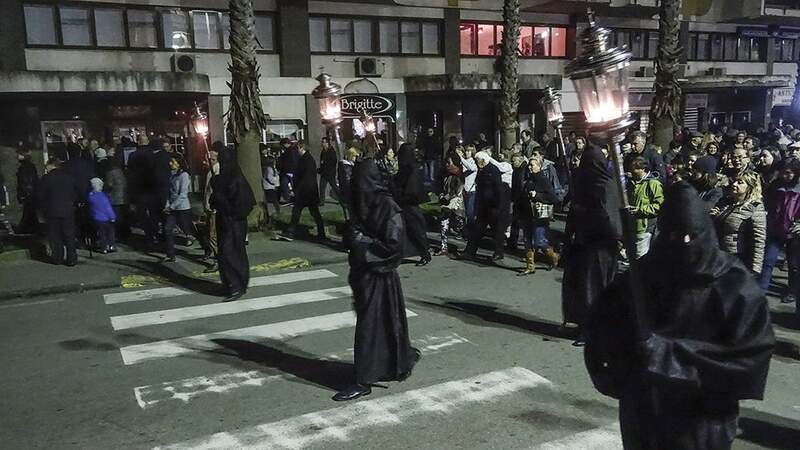 Around 100 men from the local church dress in black gowns – some hooded, some with their faces completely covered – and march through the narrow streets with torches and lanterns, chanting in Latin. A very haunting spectacle. So during the day I had an idea of where I wanted to take some photos. It was a nice open stretch of road with a lot of street lighting. What I didn’t know was that during the procession most of the street lights are switched off. I found a couple of spots to take images, but couldn’t quite get close enough with the 70mm equivalent focal length of the RX100 III’s lens. I now wished I had a lens with a longer focal length, even the 100mm equivalent of the original RX100, or the similar Canon PowerShot G7 X. However, the RX100 III did a good job in the low light conditions, thanks to its f/1.8 aperture. I didn’t have to push the sensitivity too high, and the backlit CMOS sensor kept noise to a minimum. Besides this, photographing people wearing black robes on a virtually unlit street at 10pm is a challenge for any camera. I opted against using the pop-up flash as a bit of fill-in light, in order to capture as much as possible of the ambience. It was a mistake though, as a touch of flash would have added more detail. Had I been using the RX100 II, I could have attached a hotshoe flash, but sadly the hotshoe has been removed from the RX100 III to help accommodate the EVF. Still, on reflection, I think this is the only time I’ve thought about using a larger flash on any of the RX100 cameras. My few days away with just a compact camera felt liberating. Ok, I cheated a little by using one of the best compact cameras we have tested, but the experience of travelling light was a relief to my shoulders, and I don’t really feel I missed out on any shots. When you are on holiday you are generally going to be out in fine weather, relaxing, seeing great sights and enjoying yourself. You aren’t going to need a camera with a stupidly high sensitivity, or a piece of kit that has ridiculously fast AF tracking. In this regard, the Sony Cyber-shot DSC-RX100 III can certainly replace a DSLR. The high-resolution sensor, f/1.8-2.8 maximum aperture and sharp lens means that you can shoot in low light, with a good depth of field, and impressively, the lens is still very sharp wide open. It’s all too easy to go overboard preparing yourself for any eventuality, but by worrying so much less about my camera and kit, I was then able to appreciate where I was and what I was doing; yet I still came away with a great set of images. My favourite shot of the weekend was one of the last I took. On the final night, walking into town for dinner, the light was perfect. The sun was just going down, and in the opposite direction there was a soft light on a distant Mount Vesuvius. The sky was a dull shade of purple and the shrubs and trees in the foreground nicely framed the volcano. Again, the camera coped well with the subdued light conditions, and I wasn’t overly concerned about shooting at f/2.8. This aperture still gave me a good enough depth of field, and given that the mountain was 14 miles away and would be shot through haze in dim light, I knew I wouldn’t be picking out too many fine details anyway. This image was all about the light, hues and the scene.